If you’ve never heard the sentence, “really? What colour is that then?” then there is a very good chance that you aren’t colour-blind. Congratulations, you happy-eyed champion of life. Meanwhile, if you have heard that question at least seven times since breakfast, then the chances are you’re another hue-confused human like me. That question, as bonkers as it usually is, follows me everywhere I go. I still haven’t worked it out. It’s part allegation, part inquiry, part test, part trap. I can either get the answer wrong, which does not explain anything, or I can get it right, which does not explain anything, except in a more annoying way. Sometimes the latter even leads to the accusation, “you’re not colour-blind!” as if I had lied for the sole purpose of engineering such a rivetting exchange. Whichever answer I give, though, everybody involved learns as much about colour-blindness as if they’d decided to investigate the condition by rubbing their ears on the outside wall of a zoo. 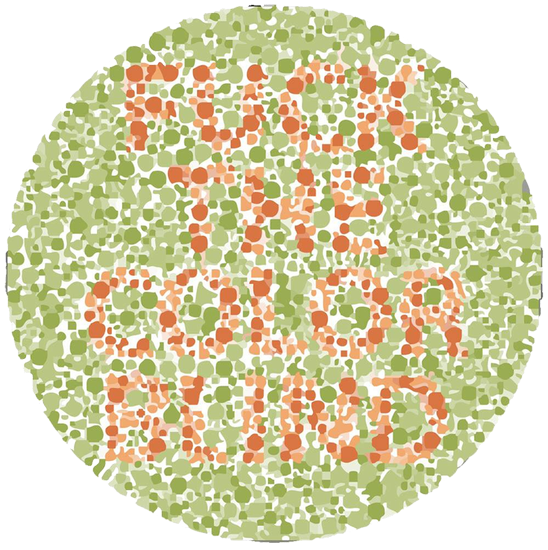 Partly it is because colour-blindness is a misleading name for the condition. Apart from monochromatic colour-blindness, which is a very rare condition that causes people to only see badgers, penguins, pianos, and chess, and actual blindness, which is what gives Stevie Wonder his heightened sense of singing, most people who are colour-blind can, in fact, see colour. They just get a bit confused between what they perceive as ‘similar’ ones. 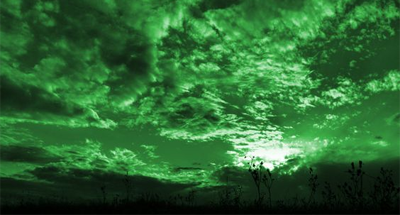 Mine – like the vast majority of colour-blind people – are predominantly green and red. Basically, the human eye has three kinds of cone, and each one picks up lightwaves on different parts of the colour spectrum. One of my types, however, betrays me when I buy bananas. They are swines amongst cones. This may not have always been the case, however. Colour-blindness is estimated to be present in as many as 5-10% of males (women just carry the gene for us mostly.) This is prevalent enough, apparently, for biologists to believe that colour-blindness might have had some evolutionary advantageous by-product which allowed the trait, and therefore us, to survive hundreds of thousands of years of Darwinian natural selection and Twister tournament humiliation. 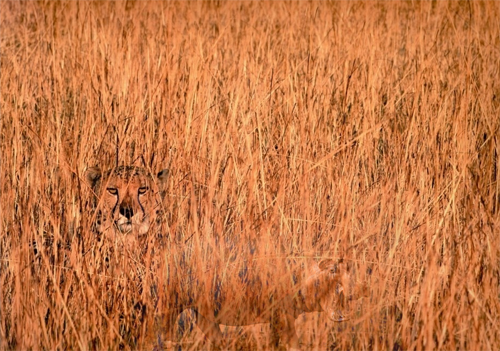 Scientists’ best bet, so far, is that colour-blind people are better at seeing through camouflage, especially in low-light conditions, so it might have been useful to have a couple of us in your tribe if dinner was something you aspired to eat rather than be. Personally, though, I think we might have just survived because it’s a bit of fun for everyone else to have a few of us around, like ginger people or creationists. My friends used to cackle like freaks, for example, when I did something colour-wacky like hit the wrong ball in a game of snooker, or get on the wrong underground line in a foreign city, or try and dress myself without girlfriend intervention. I once went to a red versus green Laser Quest game, and had to be on my own team like some muddled gump on a day out, shooting at and getting shot at by everyone. Another time, I had a ten minute conversation at a metro station with a man in ripped clothing that told me he was on his way home from a costume party. “What did you go as?” I asked him. “The Hulk,” he replied, confused. He was entirely green (apparently), and staring at me a bit like I’d lost my carer. However, us silly colour-blind folk weren’t always just an adorable bunch of goofs that you wouldn’t trust to cook a sausage. No, we used to be quite a menacing bunch of chancers — that is until frightened people with working eyes came along and stopped us. 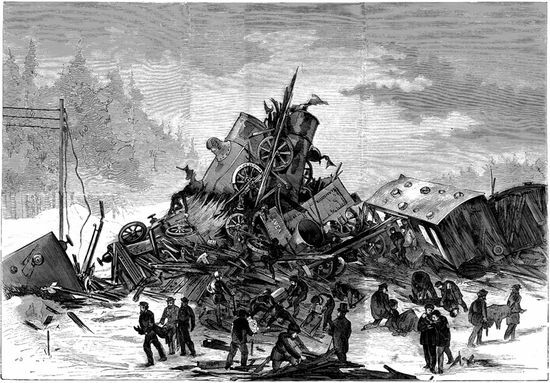 Just ask Anderson or Larson, the engineers who crashed their train into another one in 1875’s Sweden because they couldn’t figure out between them what the colour signals were to prevent them from doing exactly that. Well, that’s easy. If there is somebody in front of me at a traffic light, I follow them. If there’s nobody there, I guess what colour the light is. It might sound dangerous at first, but let me assure you that colour-blind traffic-guessing still causes less accidents than drink driving, texting, and spontaneous attacks of made-up things like Sudden Handface Disease. Ho ho ho, enough lies. The real reason, again, is that the pigment perfect population have bubble-wrapped the roads for us. 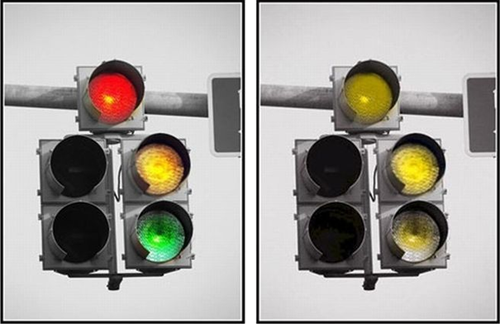 The red, amber and green in traffic lights, which would normally be our crash-spastic downfall, contain special tinges of blue and orange just for us, and the lights themselves normally live inside a reflective rectangular ‘sighting board,’ so we can differentiate between them even at a distance by their position: top, middle, and bottom. Also, we still guess a bit, but only because we have grown erratic and unhinged from our puzzled nonsense lives. After explaining that I don’t drive based on shapes and luck, that I don’t see the world like a time travel WWII documentary, and that I know the sky is blue because not everybody in the whole of human history managed to keep it a secret from me, the last question I normally get is the good one. It’s interesting because I can’t answer it. Luckily, neither can anybody else. Not even dead gravity genius Isaac Newton, even though he was the first to figure out that white light contains the whole spectrum of colours. He also poked a big needle into his eye socket and wiggled it around, incidentally, presumably to answer some other question that nobody asked about eyes, colour, or sanity. By the way, I don’t just mean ‘nobody can answer it’ in some acid-tripping hypothetical way, like, “whoah, dude, what if your blue is, like, my red, man?” — or in a ratio reversal way — as in, I’m only “colour-blind” because there’s less of me, and more of you, and if the percentages were simply reversed, “normal”-sighted people would be the weird ones getting laughed out of vegetable aisles, the freaks. The real reason is more profound, even. It turns out that colour lives a lot more in our brains than we might expect, and is a lot more related to the language we use than the hardware in our looking balls. Indeed, recent experiments have shown that the number of colour-sensitive cones in the human eye can differ by as much as forty times between people, yet most of them can still play Trivial Pursuit together without looking like some sad human in need of extra, boring attention. But what does it all mean? Well, rather than colour being an actual objective thing, like a hedgehog with small lumps of cheese on it being pushed around a party on a roller-skate, what seems more likely is that we all perceive colour based on the language we’ve collectively internalised to coordinate with each other, a little bit like how women in close proximity synchronize their periods, except not. If you took a trip to Namibia, for example, you might start having fun, difficult, silly conversations with the Himba people, who have about half the words for colour-identifying as you do. While us T-shirt wearers have eleven words for colour, the Himba tribe have four or five. While we’re getting all fancy with our decadent Western imperialist dark blues, dark greens, dark browns, dark purples, dark reds and blacks, for example, the Himba tribe have already said zuzu and milked a lovely goat. They also have vapa, which is white and some shades of yellow, buru, some shades of green and blue; and dambu for other greens, reds and browns. Incidentally, I saw it immediately, too, because I’m not ‘camouflage-blind’ — a new phrase I would like you to start adopting to refer to yourself in the likely event that you aren’t colour-blind, or ‘cone-ally challenged’ as my proud people prefer to be labelled. If you’re still not quite ready to slap that debilitating brand on your fully functioning head, though, then you might like to be pointed to the tiny minority of women who, through a trick of their genetics (they are the only gender with two X chromosomes, which carry the necessary data), have a fourth type of cone. While the usual three culprits pick up about a hundred hues each, and can therefore be combined to recognise about a million colours for us, the tetrachromats’ fourth one pushes their potential range up to one hundred million variants. If that’s not astounding enough to base the end of an already bitter-sounding article on, there’s also a species of crustacean called the mantis shrimp, which has sixteen types of cone, and can therefore perceive eleven or twelve primary colours compared to humanity’s dreadful spectrum of three: red, blue, and yellow. And what exactly would the world look like for these magic women and special prawns? I don’t know obviously. Why don’t you go and ask them ten thousand times?